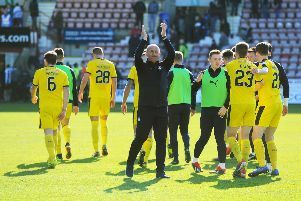 Falkirk secured their first win of the 2018-19 season with a hard-fought victory against League One Forfar Athletic. Second half goals from Dennon Lewis and Deimantas Petravicius gave the Bairns the three points after a poor first half display. One apparent certainly from tonight's game was that Falkirk would improve on Saturday's 1-0 defeat to Montrose. And in the first half that could not have been further from the truth. Eight minutes in and the first bad moment for the Bairns. Goalkeeper Robbie Mutch's heavy touch allowed Dale Hilson to knick the ball away from him, and Mutch tripped the striker for a penalty. The referee took a little while to point to the spot, but it looked obvious enough. Jamie Bain took it, with Mutch saving well down to his right, and then doing superbly to get to his feet and save the rebound as well. From the moment on, it was all Forfar until the half-time whistle. On 33 minutes, the visitors had a huge chance. Jamie Bain got in behind the Falkirk defence and squared for John Kelly who knocked wide from six yards. Just three minutes later and Falkirk's post was shaking. Dylan Easton danced through the Bairns backline before Dale Hilson's volley struck the post. 36 minutes on the clock, and clear discontent in the stands with boos ringing around. And it wasn't to get any easier. John Kelly touched the ball onto his left foot and his the post from the edge of the box on 39 minutes. There was one more chance for the Loons before the break, with striker Hilson's touch letting him down at the vital moment. Falkirk failed to register a single effort on the target in the first half. Paul Hartley made two changes at the break, with new signings Tom Owen-Evans and Dennon Lewis coming on for Lewis Kidd and Dimitris Froxylias. And those two linked up to give Falkirk the opener. Owen-Evans played the ball over the top, with Lewis taking a nice headed touch and hammering home from 20 yards. There were half chances for the Bairns, as their visitors had the stuffing totally knocked out of them by the opener. Dennon Lewis and Deimantas Petravicius both put over the bar from close range. And the killer goal came on 83 minutes. Forfar goalkeeper Marc McCallum came rushing out and got nowhere near the ball, with Petravicius lifting the ball over him and into an empty net. The Bairns held on and go second in Betfred Cup group B, behind early leaders Montrose.